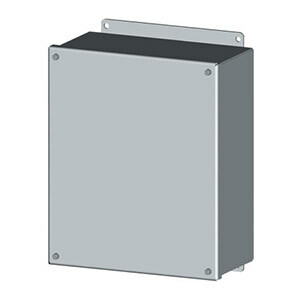 The SCE-SCR Series electrical enclosures are designed for use as electrical junction boxes, terminal wiring boxes, instrument housings, and electrical control enclosures. These electrical enclosures provide protection from dust, oil and water. Sub-panel for 6" x 4"
Sub-panel for 6" x 6"
Sub-panel for 8" x 6"
Sub-panel for 8" x 8"
Sub-panel for 10" x 8"
Subpanel for 10" x 10"
Sub-panel for 12" x 10"
Sub-panel for 12" x 12"
Sub-panel for 14" x 12"
Sub-panel for 16" x 14"